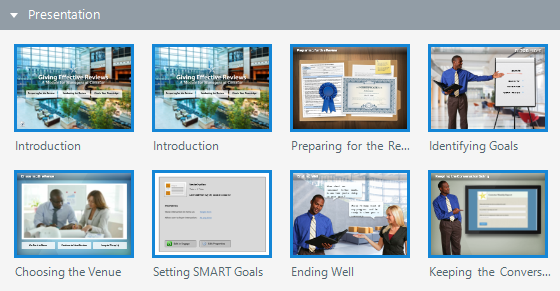 Import Microsoft PowerPoint presentations into Articulate Storyline to leverage existing content. It's a great way to speed up course development, especially if subject matter experts are drafting content for you in a program familiar to them (i.e., PowerPoint). Click Import on the Storyline launch screen and select Import PowerPoint. 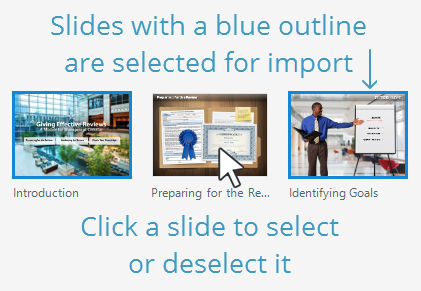 Go to the File tab on the Storyline ribbon, scroll to Import, and click PowerPoint. Go to the Home tab on the ribbon, click New Slide, select the Import tab on the left, and choose PowerPoint. 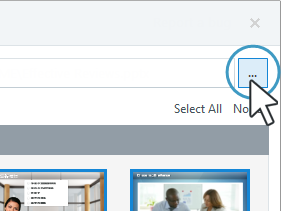 Go to the Insert tab on the ribbon, click New Slide, select the Import tab on the left, and choose PowerPoint. Tip: If your presentation includes Articulate Quizmaker quizzes or Articulate Engage interactions and you encounter an error message that one or more of them couldn't be found, see this article for solutions.